Atlanta’s Hartsfield-Jackson International Airport is one of my favorite places. It is a clean, friendly model of efficiency, organization, well-curated shops, eating establishments, and services. On top of that, it’s pretty swell as a first-rate international airport. This week, it is also a model for special events planners tasked with organizing major events. It is Super Bowl week in Atlanta and the city is expecting an estimated 150,000 out-of-town visitors, many of whom will arrive by air. Predictions are between 65,000 and 75,000 more people than usual will fly the game’s official airline and Hartsfield-Jackson’s main tenant, Delta, in the days leading up to and just after the big event. 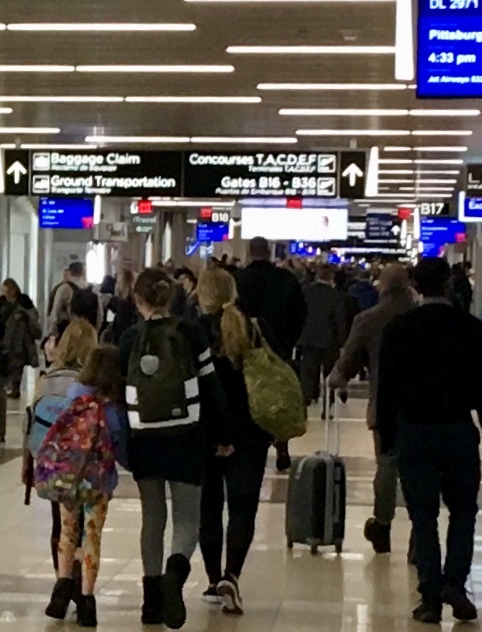 Atlanta is already the busiest airport in the world, but as I navigated my way through the conspicuously extra-crowded terminals during Super Bowl week, I was impressed because things were still working beautifully. The corridors, gate areas, and restrooms were clean, and waiting lines for everything from security to fast food were reasonable. This was thanks to months of careful planning to ensure everyone was prepared for the big week. While the Atlanta Super Bowl Planning Committee has been meeting for more than a year, according to the January issue of Delta’s Sky magazine, the company also began months ago to plan appropriate staffing, smooth traffic flow (including ensuring competing teams’ hometown fans don’t arrive and depart from adjacent gates), ordering adequate food and beverages, arranging for additional flight attendants and pilots, and purchasing extra catering and fuel to accommodate the super-sized crowd. Plans even extend to having added supplies of pillows, blankets and toilet kits ready for the inevitable travelers who plan to await flights home by sleeping at the airport. A key component of Delta’s success is that the company recruited employee volunteers to act as airport ambassadors. Dubbed “Peach Corps,” because Georgia is the peach state, volunteers were interviewed and selected for their expertise and commitment to customer service. They have distinctive uniforms making them easy to spot and they were readily apparent today, strategically deployed near trains and other critical junctions to direct people and answer questions. I watched as one assisted a panicked woman who had misplaced her cell phone. After calming the frantic woman, the volunteer called her number to locate the phone. It wasn’t long until the woman’s back pocket was buzzing and everyone nearby enjoyed a good laugh with the relieved customer. “Don’t tell your kids,” someone joked. The gracious sincerity of the Delta volunteer was impressive. The takeaway for collegiate events planners is that when we are anticipating a major event on campus, no detail can be overlooked. It’s not business as usual and assuming that our regular systems, good though they may be, will not buckle under the strain is foolhardy. Creating our own Peach Corps could be just the thing to ensure that alumni, donors, prospective students, and friends enjoy a hospitable experience and take home great memories every time they enjoy major events on our campuses.